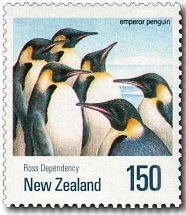 Virtual New Zealand Stamps: 1990 Antarctic Birds. Ever since James Cook sailed his ships Resolution and Adventure south of the Antarctic Circle in January 1773, New Zealand has been closely linked with this vast, frozen continent at the bottom of the world. Cook called in at Dusky Sound to replenish supplies following his epic voyage of discovery. Numerous explorers since Cook have set off from New Zealand on ambitious and dangerous Antarctic expeditions of their own. It is not surprising then, that the continent holds a special place in the hearts of New Zealanders. The legacy of exploration, however, is not the sole reason. Environmental issues have always been of paramount importance. 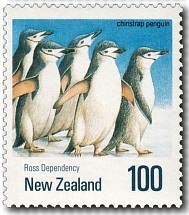 We were the first nation, for example, to suggest that the Antarctic be turned into a World Park, free from exploitation. Today, with the Antarctic under threat from pollution, mining and a potential tourist boom, the protection of its environment and wildlife is of great concern. 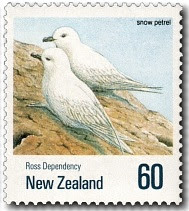 The coldest and most desolate place on earth is, interestingly, home to an amazing abundance of life, including a few hardy and populous bird species - the subject of this special stamp issue. "Survivors in a Harsh Climate" is an apt subtitle for this issue because the six species have in common the ability to breed and survive in unforgiving Antarctic conditions. The extreme climate makes survival a never-ending challenge. It is common for high percentages of eggs and chicks to be lost to bad weather, or killed by natural predators. 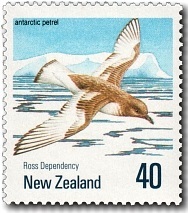 The Antarctic petrel is conspicuous by its chocolate brown and white colouring and the broad trailing edges of its wings. Underneath it is white except for some brownish mottling on the throat area. The tail has a brownish black tip. It is easily identified by the contrasting pattern on its upper parts. 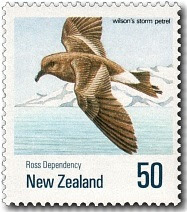 50c - Wilson's Storm Petrel. Without a doubt, this is the hardiest small bird in the world! Usually, it breeds in rocky areas where it builds a nest of small pebbles, shells and bones. Sometimes the nests become ice-bound. At low altitudes, where peat and soil are available birds dig burrows and line the nests with fragments of peat. 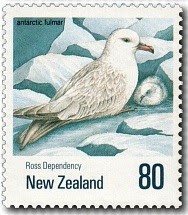 This medium sized bird breeds in colonies on the Antarctic continent and its outlying islands. It is rarely seen far from floating ice in Antarctic waters commonly circling over water between ice floes. The snow petrel has a particularly distinctive way of flying. It is extremely swift, thrashing the air with very rapid wing-beats. The actual flight pattern is, compared with many other species, quite erratic, with constant changes of direction and altitude seemingly without rhyme or reason. The casual observer could be forgiven for thinking that the Antarctic fulmar is a common gull. Not only does this petrel look similar to a gull, it flies like one as well. Holding its wings stiff and gliding for extended periods. These birds feed mainly on krill, cephalopods, amphipods and fish. They also scavenge offal from ships and sometimes take small sick birds. Dapper in their black and white suits the chinstrap penguins are easily recognisable, even at a distance, by their distinctive markings around the head area. The crown is black, the cheeks are white with a thin black line running from ear to ear downwards across the throat and chin. Perhaps one of the most familiar of Antarctic birds is the penguin with its formal and slightly pompous appearance. The emperor penguin, weighing up to 46 kilos and standing about one metre tall, is the largest variety of living penguins and among the heaviest of all birds. It has a black throat sharply marked off from a white or yellow upper breast. The head appears to be small in relation to its body.